Trade shows are all about marketing your company and products – do you understand your goals? Trade show planning requires a lot of time and effort. Your shipping needs are an important part of the planning process and an experienced logistics provider like AFP Expo Logistics can work with you to make this part smooth. But as you’re considering your trade show planning, take the time to brainstorm and understand your marketing goals. After all, the purpose of a trade show is to introduce your brand and products to a new audience! Coordinating a marketing strategy is another key component towards making your trade show a success. Here are three key areas to focus your marketing goals. 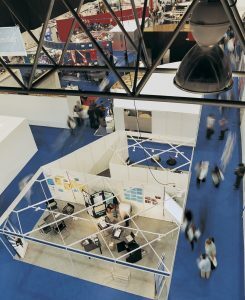 The awareness and perception of your brand will be a key element in determining trade show success. A big piece in building this brand awareness is in the construction of an effectively branded booth which can show off your credentials and your capabilities. You might choose to focus on showing off new products, reaching new segments of the market, or demonstrate how your company differs from the competition. Pick a path and focus your marketing efforts on achieving it. Increasing traffic to your booth is the goal of your floor activity. There is a lot of latitude in how you can do this, from having managers give keynote addresses or participate in conference panels to giving out free samples or providing product demonstrations. And don’t forget to utilize the power of your social media channels to fuel engagement. Counting the number of visitors to your booth is a great measurement to take when evaluating the marketing success of your trade show. Keep a count year-to-year as a baseline to further refine your marketing message. You can also use surveys of your visitors as a great way to measure the success of your marketing goals. A company experienced in providing great logistics solutions for your trade show shipping needs is a great asset in helping you reach your marketing goals. AFP Expo Logistics understands that great marketing can make your trade show a success for your business. We can deliver your branded booth, demo products, and other marketing material on time so you can get to work promoting your business! For the highest-quality logistics handling experience that will be customized to the unique needs of your business, AFP Expo Logistics is the best and only choice! We offer a comprehensive range of shipping services, and our 25 years of experience in the business have given us the tools we need to create personalized logistic solutions for each and every individual customer. For more information or to start designing your own logistic solutions today, get in touch with AFP Expo Logistics at 410.590.1234 (toll-free 800.274.1237), email us at expo@afplus.com, or fill out our quick and easy contact form here! You can stay up to date with the latest from AFP Expo Logistics on Facebook, Twitter, Google+, LinkedIn, and Pinterest! This entry was posted on Thursday, March 9th, 2017	at 3:43 pm	and is filed under AFP Expo, Trade Shows	. You can follow any responses to this entry through the RSS 2.0	feed. Both comments and pings are currently closed.